​Hillcrest Cemetery is located in the 2200 block of Stanton Road in the City of East Point, Georgia (Fulton County), just south of Georgia Highway 166 (Langford Parkway, formerly known as Lakewood Freeway). It is approximately 17 acres, and includes an estimated 10,000 graves dating from the 1880's to present. From Downtown Atlanta, take I-75/85 south to Langford Parkway Westbound (exit 243). Take the 4th exit to Stanton Road, turn left at the bottom of the ramp, and the cemetery is just ahead on the left (with some portions on the right farther down). 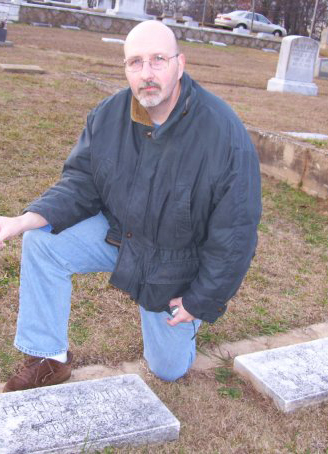 An extensive history of Hillcrest Cemetery was written by late Hillcrest Historian and East Point Historical Society Curator Steven Bramlett. It is not yet in a form to put online, but here is a brief summary. Also visit our Photos page to view several historical photos of Hillcrest. Family stories tell us that Hillcrest was established as a family burial ground around 1890 for the Hudsons, who owned a home on top of the hill in what is now the southern end of the cemetery. At some point in the future, believed to be 1912, it was established as a commercial cemetery. The earliest headstones are from the late 1800's, though some of these are thought to have been reinterments from family burials on private property. The oldest section is in the center of the back area, where there are numerous large trees. Hillcrest expanded to the south after that, then toward Stanton Road. In 1952, additional sections were opened to the north and across Stanton Road. Approximately 10,000 people representing nearly 2,400 surnames are buried and/or memorialized at Hillcrest on approximately 17 acres. Hillcrest is the final resting place of veterans from all 5 branches of the US armed services, merchant marines and Confederate army. They represent at least 6 conflicts, including: American Civil War, Spanish-American War, World Wars I and II, Korea and Vietnam. ​Today, Hillcrest is privately owned by an elderly widow of a man who bought the cemetery business many years ago. She is not able to maintain it, and is no longer receiving any funds from services. There was never a perpetual care fund, nor was one required by Georgia law. When the cemetery ran out of spaces to sell, there was no longer any current income to fund maintenance. Our organization was founded in 2001 in order to seek ways to restore and maintain the grounds. We have since grown to do a lot more than that, including record-keeping, preservation, family assistance and some basic facility management. Until a large interest-bearing trust is established through donations, grants and other sources (likely many years away), the upkeep of Hillcrest Cemetery will fall to the families and other supporters. Our organization serves as a conduit through which funds and volunteers can be brought together for this sacred ground to receive the most maintenance for the effort. All brush was cleared from graves and related areas between 2001 and 2009, thanks to many, many cleanup events involving from 1 to 100+ people at a time. Special thanks to Bobby Crow taking it on as his Eagle Scout project, as well as to his mother, Glenda. Other groups involved included Hands On Atlanta and the Atlanta Community Tool Bank and Students Today, Leaders Forever. ​After 8 years of clearing brush and seeing noticeable progress each time, we turned our attention to "less exciting" tasks such as leveling uneven ground, repairing driveways, paying closer attention to details, and small projects. During this time we were at the height of fund-raising for Hillcrest, and the money raised during these years has allowed us to keep mowing to this day, but the funds are starting to dwindle and we may begin to cut mowing frequencies to stretch it out. We will also try to revitalize interest and start raising new funds to supplement them as well. Donations are currently being accepted our Support Us page. We designed and collected special donations to build a memorial to the veterans of Hillcrest Cemetery. The brick and stone wall was completed in January 2010, with the engraved donor and honor bricks added a couple years later. This project was led by original board members Cam and Margene Sutherland and other board members. It was conceived by late board member Joe Barnett. Both Cam and Joe are US Army Veterans themselves. In 2010, long time board chairman and volunteer event coordinator Kevin Hudson moved from his home three blocks from Hillcrest to Athens, GA—over an hour away. Since then we have only had a few cleanup projects, but we want to start having two open house events at Hillcrest each year, which will serve the dual purpose of a family day when everyone interested can come to visit graves as well as a cleanup day to tackle seasonal projects such as removing fallen limbs, collecting old flowers, and just sprucing up before the Easter and Christmas holidays. If they happen, these events will be announced on our Facebook page. Visit our Facebook page here for updates and current events.